His hair was so stylish, for a modern woman. Happy All Saints Day everyone! To those of you in North America that doesn’t mean much, but to the folks here in Europe it means a lot. All Saints Day is when the Catholic Church and some Protestant Churches commemorate saints, known and unknown. Traditionally, people lay flowers and candles around the graves of loved ones in the belief that there is a prayerful spiritual communion between those in the state of grace who have died and are either being purified in purgatory or are in heaven. The eve of All Saints Day is All Hallow’s Eve or Halloween. For us, All Saints Day meant everything was closed. We knew this would be the case so we didn’t rush to get up or get ready this morning. 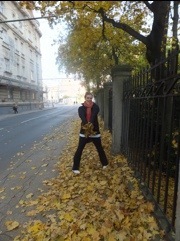 Eventually we struck out for a walk in the crisp fall morning air. The streets were not busy, as there was really no where to go. The only places open seemed to be shops overflowing with flowers. We walked past the cities main cemetary and spotted many graves that were already decked out. We think we will walk past again tonight and see how it has evolved. 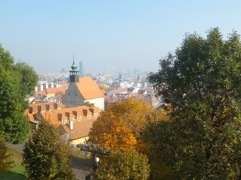 We’d already done a pretty thorough sweep of Old Town yesterday so we did most of our walking in the newer area. Eventually we came to a mall and stopped in to find a bathroom. Like any shopping mall at home, it was open despite it being a holiday. This became our refuge for the afternoon…as our hostel lacks a really good common area. We ate lunch at the food court, getting food from a place called Schnitzel Hamm. Then we did some trip planning at our food court table. Eventually we got up and made our way to the movie theater. The choices weren’t stellar but we ended up going to The Three Muskateers. Did you know that in Slovakia/Slovenia/Croatia region, mainly only children’s movies are dubbed? Most Hollywood films are shown in English with the countries language in subtitles…this is what our movie was like. We slowly walked back to the hostel and stayed there the rest of the night. We watched Glee, did trip planning and made Kraft Dinner. You may recall us complaining about there not being KD in Europe…there still isn’t. Momma & Papa Padget brought it over when we met them in Italy. 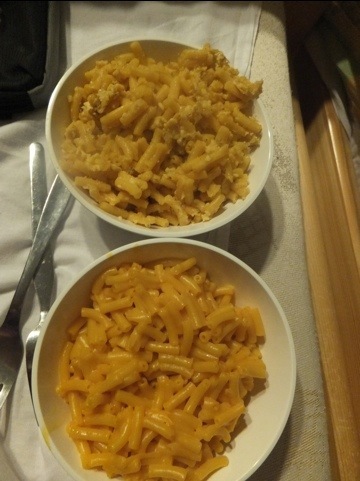 We made both boxes, one as regular Mac & Cheese and one fried up with eggs. Yum! Yum! Yum! Tomorrow we will try to be more exciting people! Good Morning Boys & Ghouls! And a very Happy Halloween to you all! We will not be dressing up this Halloween 😦 because we have no costumes, no party and are in Bratislava. 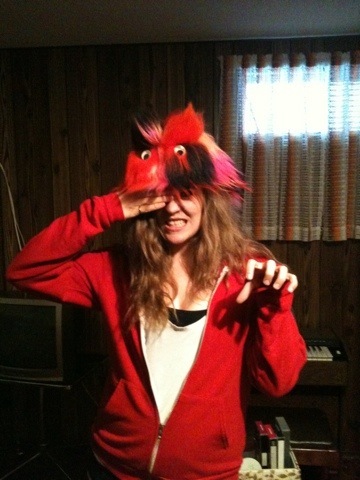 But there was this one time that Kristin dressed up like Lady Gaga. 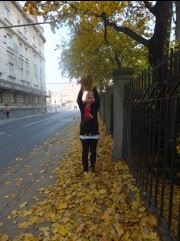 We walked back to the city center, hitting the tacky tourist shops as we went. Eventually we sat down for lunch. We shared a Margherita pizza and a Bratislava pizza, half & half, with some Fanta. (As a side note, we ❤ Fanta!) A Bratislavan pizza, for those of you who are wondering, is topped with tomato sauce, mozzarella cheese, ham, corn and chilli peppers. 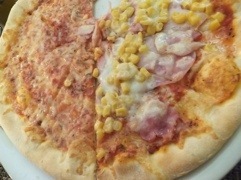 Both pizzas were delicious and we have come to the conclusion that we need to cook with corn more. 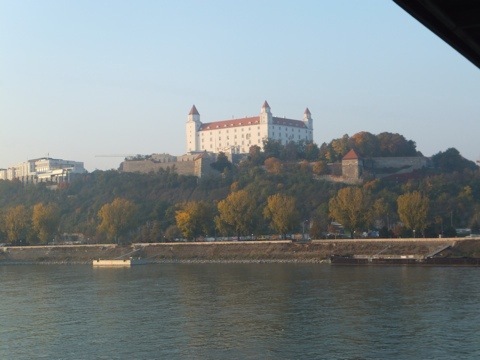 Bratislava is the largest and capital city of Slovakia. The city is the only national capital that borders two independent states. From the height of the castle you could see both Hungary and Austria as well as Slovakia. 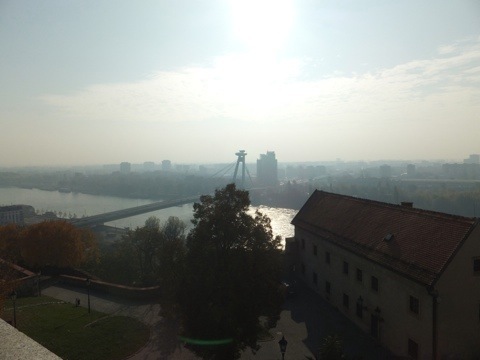 The city was the capital of the Kingdom of Hungary for many years and later an important city of the Austro-Hungarian Empire. 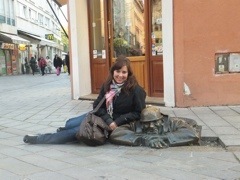 There are many quirky statues around the centre of Bratislava. We stumbled upon many ourselves and our tour guide led us to some others. The Watcher peaks out of a manhole on the corner of a street. He is the most popular statue in the city. A “Man at Work” sign had to be put up above him because he had lost his head twice to drivers. 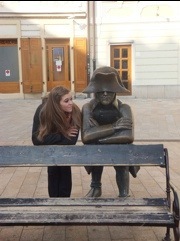 We made sure to rub his cap as tradition dictates this means you’ll return to Bratislava in the future. The French army soldier statue looks a lot like Napoleon, who attacked the city twice…but why isn’t he wearing any shoes? The third statue was Schooner Naci. 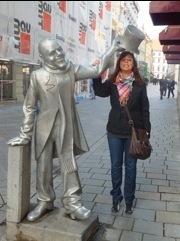 He is a man who, after failing to make a living as a clown or actor, began walking the streets of Bratislava. Always dressed in a suit with a top hat, he would give flowers to ladies passing by. 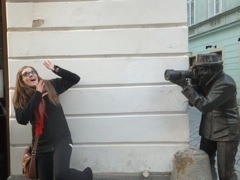 The last statue is the Paparazzi. He peaks around the corner with no historical significance to the city. 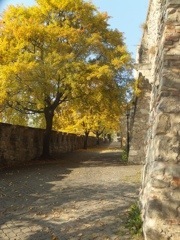 Michael’s Gate is the only gate still from the medieval fortifications of the city. The gates dates from 1300 and it is a Bratislavan legend that talking while walking through the gate will bring bad luck. We tried our best to be super silent walking under it…but when someone tells you you can’t talk, all you want to do is talk…even if you above nothing to say! 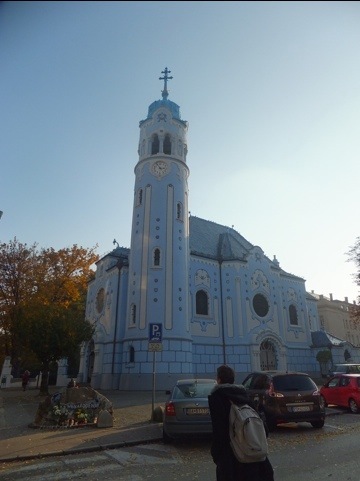 The next stop was the church of St. Elizabeth or the Blue Church. This church in consecrated to Elizabeth of Hungary who worked for and helped the poor and needy. After her death, miracles occurred when people visited her grave. She was canonized and the Blue Church was built. No one really knows why it is blue, but the do know it was not because Smurfs built it. It was still much to early for supper but we had nothing else to do so we sat down at a nice little restaurant for a drink. We were quite surprised but very excited to see hockey playing on one of the tv’s inside, St. Petersburg was playing Moscow. We sat side by side so we could both see the tv, not because we particularly cared about the game but because it been 77 days since we were in Canada & we like things that make us feel at home. 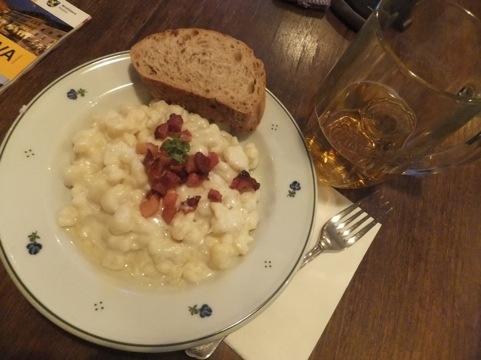 For supper we had bryndzové halušky or potato dumplings with sheep cheese and pieces of bacon. Ths is a sueor traditional Slovak dish tha is incredibly delicious! Try not to overload on the tricks & treats tonight! 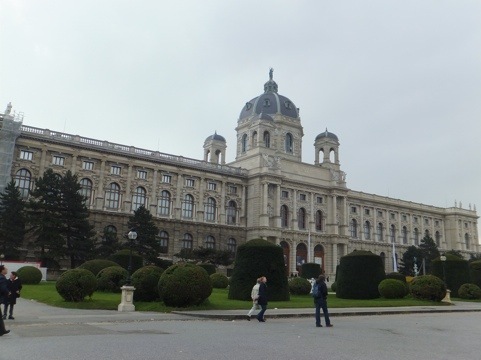 Our plan for the morning was to go to the Kunsthistorisches Museum. We hopped on the metro and got off right outside huge, old-looking, stone, twin buildings. Our museum wasn’t open yet so we wandered through the open area between it and it’s mirror image. That’s when we noticed the sign…”The Dinosaurs are Back!” We dare any of you to see such a sign and not be intrigued! 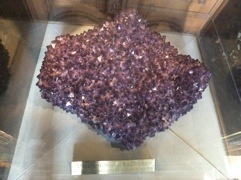 It turns out that the twin building also held a museum, a Museum of Natural History. 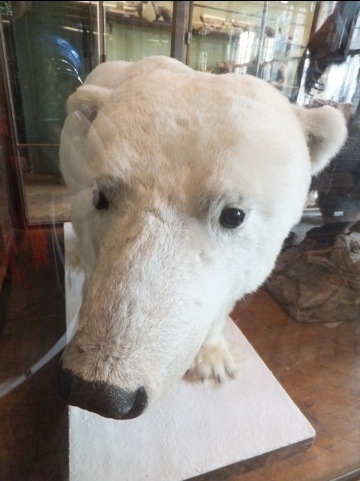 By now even our new, we-don’t-actually-know-them-in-real-life followers should know that this would catch our attention way more than a museum full of art…plus it was alredy open! 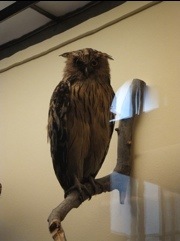 Needless to say, we changed our plans and visited the Natural History Museum. 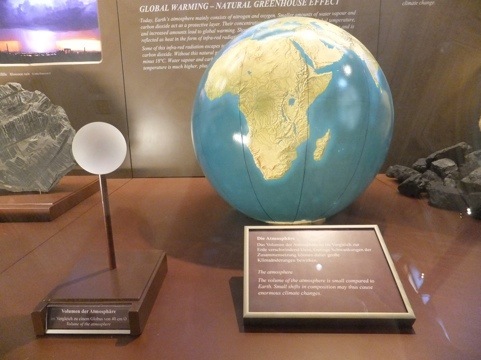 The first floor of the museum was an evolutionary look at our planet from the beginning. 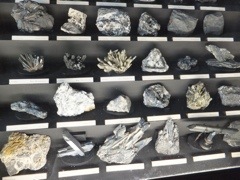 It started with rocks…lots and lots of rocks…and minerals….and such…They were very pretty to look at, but being as we wouldn’t have known most of the names in English we were extra lost in German. We needed a GeoPhys to help us out…where are you Mr. Styan!? We then progressed through small marine critters, up to more complex & giant marine critters. 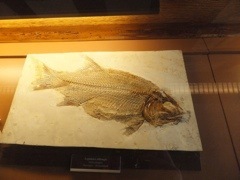 In this phase we saw a lot of fossils, and aren’t fossils just the coolest things?!? They are millions of years old and yet have a perfectly preserved image of something that doesn’t even exist anymore in them! Super cool! 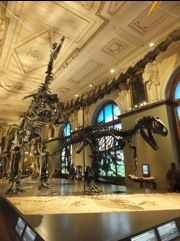 Next animals got legs and came ashore and from here we get those large reptiles that once roamed our planet: dinosaurs! 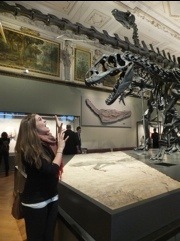 Yeah, Dinosaurs! There aren’t even words for how cool they are! 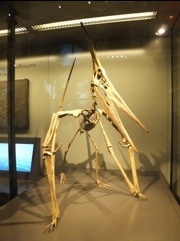 After pulling Kristin away from the dinosaurs we came upon the emergence of mammals. 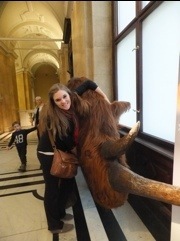 Justine loves the mammals from this time. All the cool mammals lived during the Pleistocene. Sabertooth kitties, wooly mammoths, giant sloths and wooly rhinos…basically things that exist now but in a bigger, scarier, hairier version…sounds awesome! The second floor focussed on the animals on the planet today. 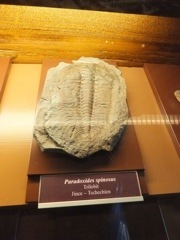 We began with the invertebrates in the ocean. Beginning here Justine tried to remember what she has learned in all of her animal classes. She doesn’t know any German but she did have to learn many of these words in Latin. Latin is universal and helped her identify things she knew! However, the marine organisms of the North Pacific are not the same as the ones in the Mediterranean. Next came the insects and many legged critters. The beetles were the most interesting thing here. They come in so many colors and patterns! In general it is amazing how many different types of insects there are out there (there are over a million known insect species!). Moving on to vertebrates we came to way more fish and birds than we would have liked. 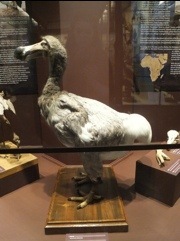 We did see some cool birds that we didn’t know actually existed….and one that doesn’t exist anymore, the dodo bird. He was awfully funny looking. 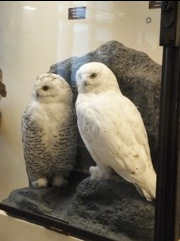 While looking at owls we picked the ones we would have had as pets if we went to Hogwarts. Amphibians and reptiles consisted of many little and cute frogs and salamanders but also giant lizards and snakes. Kristin found these interesting, Justine looked the other direction. The many alligators in the center were also frightening. Mammals was the most enjoyable part, and what Justine knew most about. 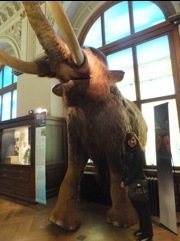 Though she doesn’t know that Latin names of Austrian mammal species…zoology 408 only taught her the mammals in Alberta. We liked scoping out the things that reminded us of home, along with the guys who were totally weird & exotic. There was also a really cool, interactive exhibit dealing with extremes. We learned about how animals survive in places where it is very hot, cold, dark or there is a lack of oxygen. It was really effective because there were things for you to look at, touch and hear everywhere. When we’d finished being educated we set off in search of lunch. 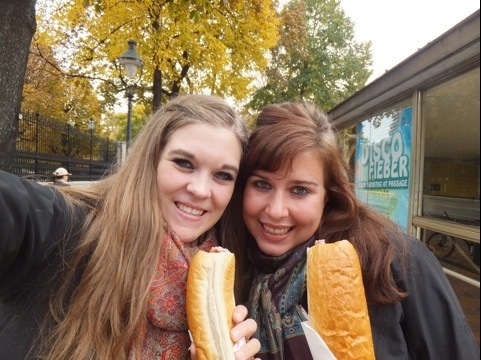 We ended up getting a hot dog from a street stall…but don’t think for a second that this would be a disappointing birthday lunch for Kristin…it was sausage! The hot dog was made in an interesting fashion; they cut the top off the bun, squirt in the ketchup & mustard and then shove in the sausage. This way your wiener & condiments are enclosed within the bun so its very neat & tidy…great for walking and eating. But we did not do that. Instead we found a bench in a nearby park and enjoyed the view of some random old stony building. This city is full of these great looking places. There are just too many to keep track of! We followed lunch up with dessert. Don’t judge, everyone deserves cake on their birthday! 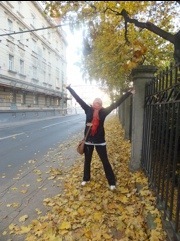 Plus it was our third day in Vienna, on our third trip to Austria and we still hadn’t tried the famous Sacher torte. 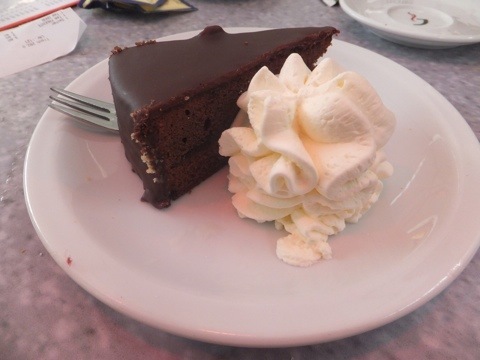 Sacher torte was invented by Franz Sacher in Vienna in 1832. The cake consists of two layers of dense, not overly sweet chocolate cake with a thin layer of apricot jam in the middle and dark chocolate icing on the top and sides. The only place where the Original Sacher Torte is available outside of Austria is in the Sacher shop in Bolzen, Italy. There was a slight tanginess from the marmalade & the ganache was tasty that we guess set it apart a little. But, in our opinion, it tasted like chocolate cake…good chocolate cake, but chocolate cake all the same. Now comes the ever exciting part of our day where we ride a train. We are sure you are sick of it by now so we will make it quick…We went to the hostel, grabbed our bags. We then took the metro to the right station and hopped on the train. For the first time on the continent we actually had to buy a train ticket. Slovakia is not covered by our Eurail passes for some unknown reason. We were good girls and bought the ticket, but being as it only needed to be from the last train stop in Austria to Bratislava it only cost €4. Lucky we did, they actually checked our tickets on this stretch of the ride. 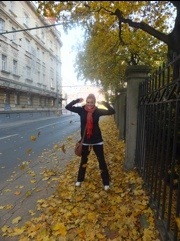 Just over an hour later we arrived in Bratislava where we walked the couple of blocks to our hostel. Easy-peasy! The hostel is ok. We are in a 6 person room that is a little squishy, one of those rooms where the jam in as many beds as possible and leave little room for walking. The bathroom is nice though and there is a kitchen for us to use if we want…which we actually might do this time. Do you not know anything about Slovakia? We didn’t really either…that is until Justine pulled our her handy Wikipedia app and informed us. How about she does the same for you! Slovakia has been a part of many countries and kingdoms since Slavs first arrived here in the 5th century. Slovakia has been part of the Kingdom of Hungary and the Austro-Hungarian Empire. After the First World War Slovakia formed Czechoslovakia with the Czech Republic. This country fell apart during WWII, but otherwise lasted from 1918 to 1993. After the war, Czechoslovakia fell under Communist rule until 1989. Today Slovakia is an independent state. In recently joined the EU and in 2009 the country adopted the Euro. 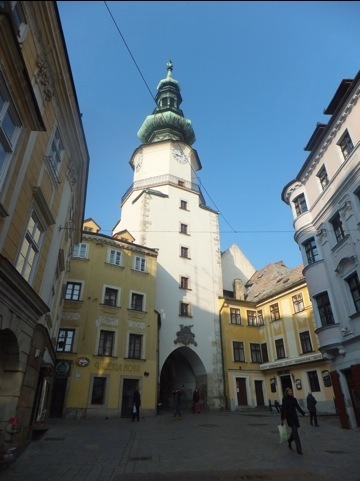 There are 6 World Heritage Sites in Slovakia! Though, unfortunately, we don’t think we’re not going to see any. We walked to the Old Town center for supper. After examining a few menus displayed on the street, we picked a place. We had to walk down an alley, down some stairs into a basement, go down a hallway, through a door and past a bathroom area, but we eventually got into the restaurant. The trip was worth it. The food was delicious and the beer was cheap (as was the food). 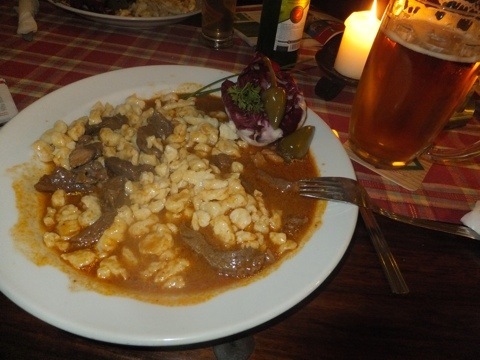 We both had a dish that combined meat cooked in beef broth with a spatzle-like noodle. Kristin paired it with a Slovakian beer she can’t pronounce and Justine had a Radler. Post dinner Kristin was exceptionally hyper. We are talking seriously giddy, to the extreme. She was bouncing off the walls in the restaurant, pointing out every countries embassy on our city map…and all of the tennis courts, which Bratislavans have went to the trouble of labeling for us. On the walk home Kristin almost died. Ok in reality she tripped a little on a dip in the sidewalk…and we are talking a little; she didn’t even fall down. But in the moment she saw herself falling into the street & being hit by a bus, so her whole life flashed before her eyes. Her conclusion after seeing a replay of her first 24 years: she’s pretty much awesome. – Look at this photo.. Did you ever realize how small the volume of the atmosphere is in comparison to the volume of the Earth!?!? Love, Luck & Lions, Tiger & Bears…oh my!